Austin, Texas – July 1st, 2017. People from all over Texas will gather at Wooldridge Square Park (900 Guadalupe St., Austin, TX 78701) on July 1st, 2017 at 9 AM to celebrate not only our Independence, but our return to American Exceptionalism by marching forward for America First. This march was prompted by the constant attacks on our President and sparked a response in the citizens of Texas that want their voices heard. In 1776, we the people of the United States of America declared our Independence. We march for America, for Freedom, for Liberty and Justice. Bring Your Flags, bring your Patriotism, as we stand up and march to the capital in support of our country and its return to greatness. 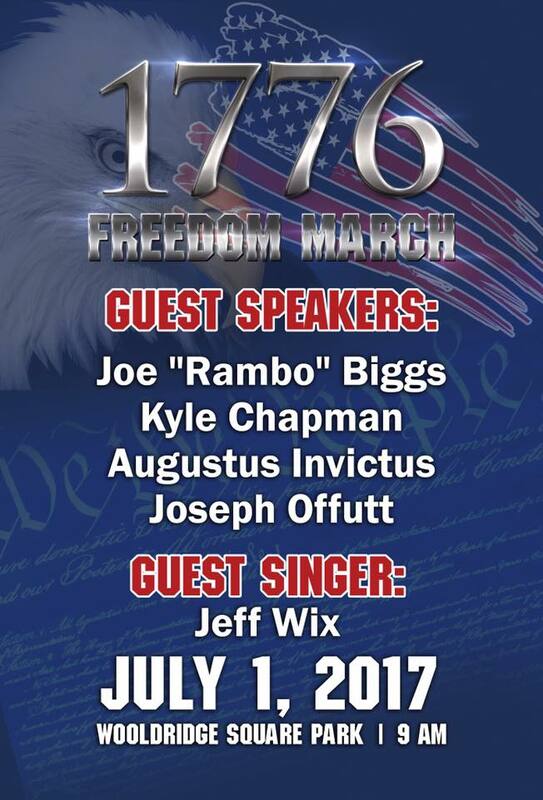 We have an incredible lineup of guest speakers: Kyle Chapman (based stickman), Joe “Rambo” Biggs, Outlaw Morgan, Joseph Offutt, Augustus Invictus, and Black Rebel. At 9 AM, we will begin our march at Wooldridge Square Park, and make our way towards the Capitol.